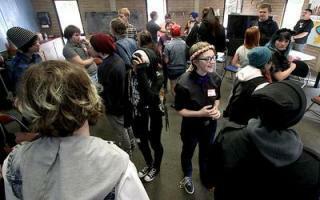 SANTA CRUZ — Heather Turley and Anissa Balderas stood face to face Saturday during an ice breaker at the Gay-Straight Alliance Summit. Balderas, 16, who was also a student at Watsonville High School, smiled and the two laughed. They were two of 20 middle school and high school students from across the county attending the event, which is meant to meant to help students network with each other. Santa Cruz County’s summit has been put on since the late 1990s and has been hosted by the task force for three years, Stuart said. Liz Torres, 16, from Pajaro Valley High School, had never attended a summit before but recognized the significance. “It’s important because a lot of people don’t know about the support network like this and events like this,” she said. Students mingled at the beginning of the event, some wearing costumes or dressed in drag in preparation for a costume contest at the end of the day. Everyone wore name tags that displayed their name in addition to what pronoun they wanted to be used for them. Kane Tajna, 17, who was born a female but identifies herself as a male, had “he/him/his” written on his name tag. Tajna lives in San Jose but was invited to lead a workshop that explores gender roles in modern society. In addition to networking, the event is also meant to for students to share ideas with one another on how to create safer, friendlier communities at their high school. See article in Santa Cruz Sentinel.